Like other mammals, horses carry their foals in the uterus, with babies entering the world through the vaginal canal. 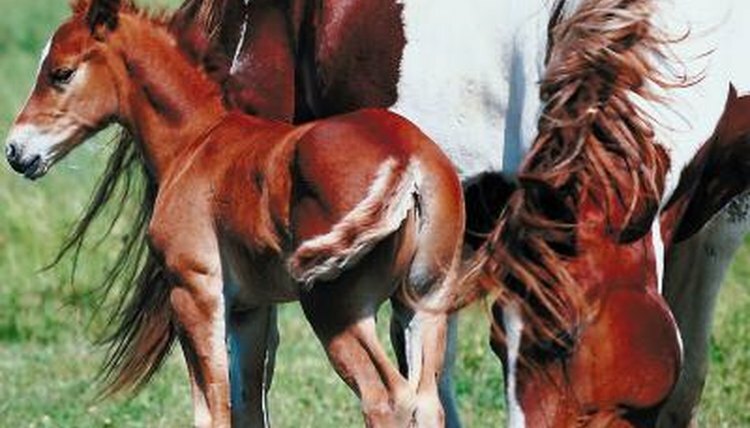 Until later in the pregnancy, most mares don't become especially large. The American Association of Equine Practitioners recommends treating your mare normally for the first seven months of pregnancy, including maintaining a regular riding schedule. The mare carries the foal for eleven months, from conception to birth. Equine gestation periods average 340 days, with a few days more or less nothing to prompt concern. Foals born before day 315 are premature; those born less than day 300 probably won't make it. Foals born beyond day 370 are usually small rather than large, as the longer term results from delay in their development while in the uterus. For the first three months of her pregnancy, the mare shows few, if any, changes in her body. However, she doesn't come back into season and shows no interest in stallions. Your vet can generally determine whether or not your mare is pregnant by performing a rectal palpation by day 50 after the mare's last breeding. An ultrasound can determine pregnancy within two weeks after conception. By day 150, the foal's limbs are completely formed and the fetus weighs approximately two pounds. Just 30 days later, his weight has quintupled and he has eyelids that blink. By day 250, he gains a pound every day, so the mare begins looking larger and pregnant. At day 300, his lungs are developing -- that's why foals born before this milestone don't survive. Since the foal grows so much in the final four months of pregnancy, the mare requires additional feed to meet the baby's needs. After the seventh month, you can ride your mare lightly but avoid excessive exercise and stop riding by the ninth month. Not all foals are carried to term. Common causes of foal abortion include twinning, which occurs infrequently in horses and often doesn't turn out well even if the twins are born. Most twinning abortions occurs between the eighth and ninth month of pregnancy. Problems with umbilical cord also lead to abortion. Certain bacteria or viruses can also cause a mare to lose her foal. The most common include Potomac horse fever, equine viral arteritis, leptospirosis and equine herpes virus. Some fetuses fall prey to fescue grass toxicosis, when the mare consumes fescue grass or hay infected with the Acremonium fungus. With fescue toxicosis, the pregnancy might actually be prolonged, but the fetus is dead. If your mare has foaled before, there's a good chance her pregnancy will run about the same number of days. Her udder noticeably develops about a month before foaling, although it's earlier or later in some mares. Roughly a week prior to delivery, the foal drops down and you'll notice her hind end softening. You might notice some milk dripping out of her teats a day or so before she foals. Put her in a safe, prepared area for her to foal at least two weeks before her due date. Mares going into labor often become restless. Many mares don't want to give birth when humans are in attendance. If you're foaling her out at your own farm, invest in a mare cam so you can watch the proceedings from your home until she starts delivery. Call your vet as soon as signs of labor begin. With luck, your eleven months of waiting result in a beautiful, healthy foal. Equine Reproduction: Is My Mare Overdue?